One of our favourite things about red-carpet events is, of course, the fashion. And although it’s not often that our national leaders become the subject of fashion headlines, the annual State of the Nation Address (SONA) always forces them to put their best foot forward, or at least make an attempt. But what’s even more rare than politicians in ball gowns has to be a “who wore it best” moment between a politician and a celeb. And yet this year’s SONA has given us such a gem and the internet is just lapping it up. And if you know us, you'll know that we just love a good b***t stole my look moment. This time, the battle is between IT girl and actress, Nomzamo Mbatha and ANC MP, Dikeledi Mahlangu. The dress is a 2017 collaborative masterpiece between Brand Three Sixty and celebrity design house, Rich Factory. 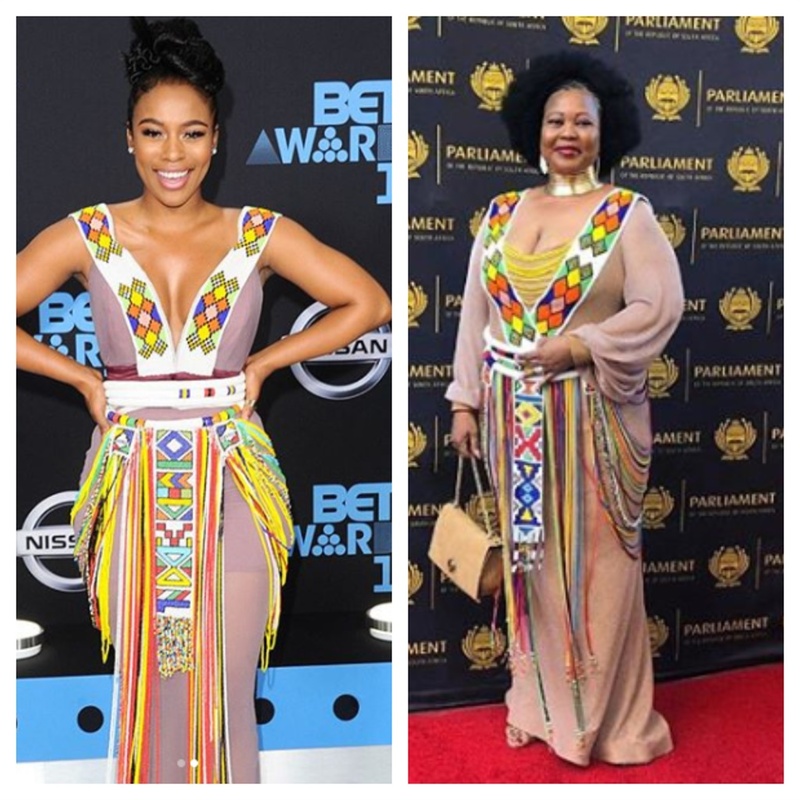 It is a beautifully-beaded Zulu dress which Nomzamo called her “Zulu Love Letter”. She first wore it to the 2017 BET Awards in Los Angeles where she hosted the BET A-List red-carpet special. The Isibaya star chose an African braided up-do and simple diamond earring studs to accessorize. Meanwhile, MP Dikeledi wore the dress to the 2019 SONA last week. She closed up the breast area with yellow beads and chose to rock her natural fro with the look. The MP accessorized the look with a gold African neckpiece, some drop earrings and a handbag.